'Look where their febrile imaginations and breathless prose took his predecessor,' says banker S Muralidharan. 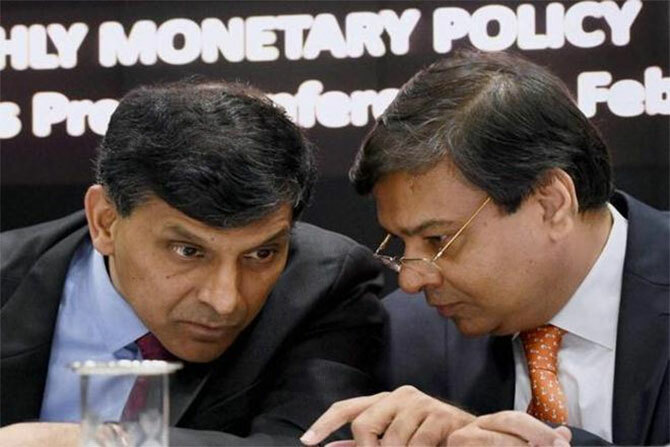 IMAGE: RBI Governor Dr Raghuram Rajan, left, with his successor Dr Urjit Patel. 'A safe pair of hands is not a bad thing in central banking and Dr Patel appears to be much more than merely 'safe',' says S Muralidharan. 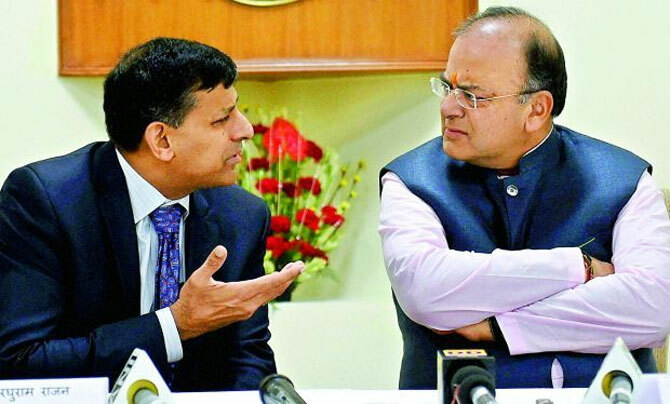 When all the hullabaloo was going on about Dr Raghuram Rajan's continuance as the Reserve Bank of India Governor, in one of my more lucid and pragmatic moments the thought occurred to me that the best thing for a politically besieged PM to do was to play safe and pick someone from within the RBI. 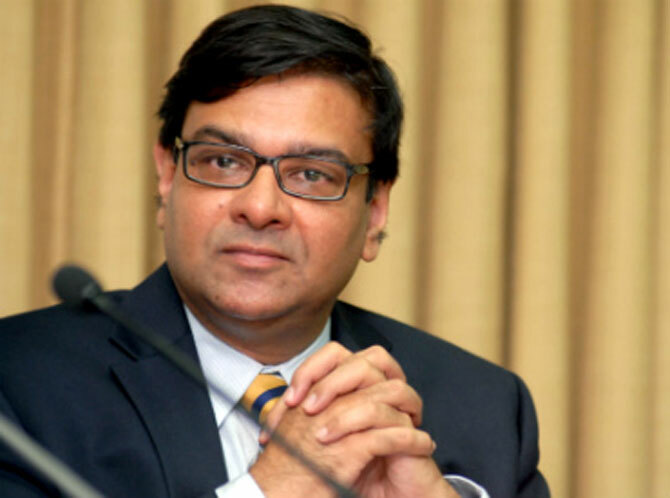 I know this can sound less than complementary to Dr Urjit Patel, but it is not my intent to demean his credentials. Rather it is a reflection of the sad and unnecessary controversies that were visited upon an apolitical institution like the RBI and to some extent, the poisoning of the chalice from which Dr Patel has now to drink. Dr Subramaniam Swamy's public and personal attacks and rather unseemly antics put paid to the chances of Dr Rajan continuing as well those of a couple of eminent economists possessed of impeccable credentials succeeding him. But I am happy to note that the new governor designate appears to have received the gadfly's seal of approval. Good sense appears to have prevailed in the government as to the question of appointing a banker to this critical position. Bankers are too invested in maintaining the status quo in the system, especially as regards the much-publicised NPA (non performing assets) issues to make clear, forward looking and sound economic decisions concerning banks and how they are supervised. 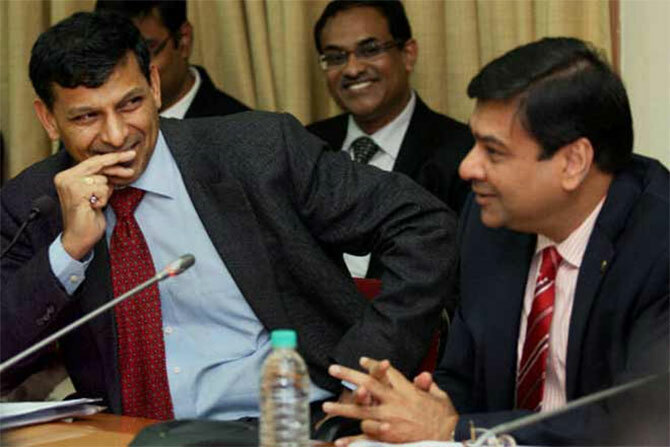 Besides, there isn't a banker at the top today who is credited with any economic know-how, beyond the mouthing of obligatory inanities following the periodic RBI Reviews (if you don't believe me, please read their comments in the leading newspapers on Dr Patel's appointment). 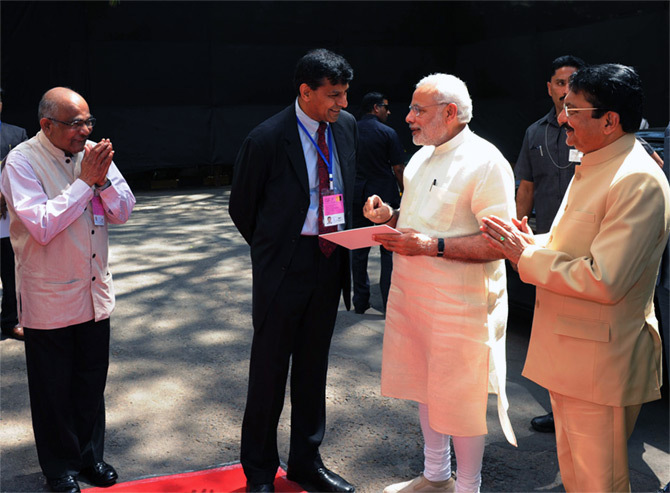 IMAGE: Prime Minister Narendra Modi with RBI Governor Raghuram Rajan. On the left, former RBI Governor Dr Y V Reddy. If there's one thing that any central banker must achieve, it is fostering confidence: Confidence in the economy, confidence in the financial markets in general and in the soundness of the banking system in particular. A high profile, capable but controversial rock-star is bound to willy-nilly attract attention of the unwelcome sort. Being wounded is sufficient to shake the confidence of the person as well as the institution he represents. Dr Swamy knew this when he was shooting to wound, perhaps even to kill. By casting aspersions on Dr Rajan, he made sure of the latter's exit. By laying out his yardstick for all to see, and announcing that they would be measured, he fatally wounded some others in the running to succeed Dr Rajan. His actions have also placed a heavy burden on the new incumbent and to some extent narrowed the options available to him. Dr Patel's status as an 'insider' should go some way in neutralising the 'swadeshi' Gentlemen of La Mancha ever ready to tilt at imaginary Westernised Cultural and Policy predilections. But that does not let him off the hook as far as public and political expectations are concerned. The agenda has already been set by the likes of Dr Swamy with their shrill, peevish and simplistic demands for interest rate reduction. It will be interesting to see how Dr Patel handles the gadflies with the maturity of egregiously petulant three year olds. That Dr Patel does not, in so far as we can tell, cause society matrons to gush like hormonal teenagers can only be a good thing for him. Look where their febrile imaginations and breathless prose took his predecessor. Dr Patel's hitherto low profile in the media should be a blessing and should help him get on with his job without crossing swords with the puffed-up political class and a pompous press. On the minus side, he would be very hard put not to grant the political wish for lower rates. It would be a miracle if he could hold the rates. But then Miracles have been known to happen. IMAGE: 'Subramanian Swamy's actions have placed a heavy burden on the new incumbent and to some extent narrowed the options available to him,' feels S Muralidharan. Surely the following must be top of any one's list: Interest rate, Inflation and Banks (and their NPAs). I would add RBI's relationship with the government to that list. Top of the agenda will, of course, be the demands for interest rate reduction. This is fraught with political sensitivities and as I mentioned earlier on, Dr Swamy has more or less ensured compliance with his wishes. Are interest rates the only factor holding up growth? We are being told by the men of La Mancha that it is so, to the singular exclusion of all other factors. The parliamentary logjam and the competitive vitiation of the Indian polity and public space in order to score quick and cheap political points would deter anyone looking for an investment avenue even if they had a billion dollars burning a hole in their pocket. Likely that the lack of growth is due to the lack of investment which in turn is probably due to the lack of adequate modern infrastructure. Creating infrastructure itself will grow jobs massively. How many kilometres of roads are we laying everyday? With the chasm between the Centre and the states ever widening, is there a congruency of thoughts and a clear division of responsibilities in commencing and completing infrastructure projects, especially land acquisition? States are being run on populist local issues, the solution to which usually seems to involve massive dollops of freebies. Rate reduction will certainly enrich the already rich, but will it make a better life for the hoi polloi? These are political questions, but Dr Patel can hardly hope to dodge answering if he wishes to do the right thing. The interest rate reduction has another angle to it: It would reduce the incomes of millions of retirees living on their savings invested in banks. These retirees are already struggling to make ends meet thanks to many factors, not the least of which is the rampant consumerism of their children hitherto regarded as their putative retirement plan. They are said to be urban, over sixty (of course) and generally tired of the socialist secular shenanigans of the previous dispensation. Angry seniors with time on their hands can be quite dangerous. With elections looming all over the place, does the present dispensation want to antagonise them? Is it going to be Adani or Nana-Nani? IMAGE: 'Inflation disproportionately and unfairly targets the poor more than it does the rich. Nana-Nani feel its heat much more than Ambani,' says S Muralidharan. Another face of the problem is inflation. Out on the streets, inflation is high despite the government telling you otherwise. I just bought a kilo of aaloos for 40 rupees. Even allowing for the packaging that is way, way too much. Inflation disproportionately and unfairly targets the poor more than it does the rich. Nana-Nani feel its heat much more than Ambani. Will 1% reduction in interest make Ambani palpably wealthier? I know for a fact that it will visibly accelerate Nana-Nani's hitherto slow descent into genteel poverty and make it a headlong rush. 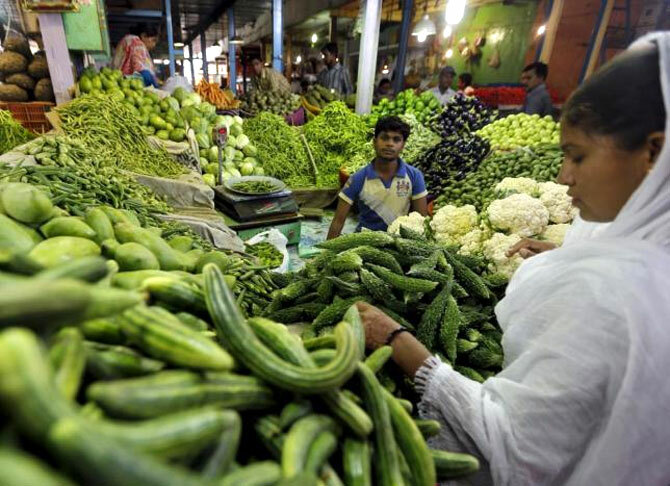 Inflation can be a potent factor in the upcoming elections. Caste and religion have already been added to the political cauldron with the BJP generally coming off the worse. If we were to add prices to the mix, the BJP's electoral chances will be sealed. Perhaps even forever, giving real impetus to the clarion call 'East or West, North or the Rest, Gandhi is best' whose appeal appeared to be fading for a while after 2014. Of course, the central bank governor cannot make economic decisions based on the electoral calculus. But he can hardly ignore politics for it is what takes economics from the ivory towers to the mohallas. But he needs to sell to the government of the day what needs to be done -- in the language they understand. IMAGE: Reserve Bank of India Governor Dr Raghuram Rajan with Finance Minister Arun Jaitley. 'That is the problem with the economy: It involves working with the very people who are doing their damnedest to wreck it,' says S Muralidharan. I suspect Dr Patel will face his toughest challenge in his attempts to tackle the banking problems. It is in this endeavour that the interests of different interest groups coalesce, if you will pardon the pun. The Mallyas etc have not built huge empires by quietly going away with their tails tucked between their legs when caught with their hands in the cookie jar. They will view Dr Rajan's exit and the transition as a respite if not an outright reprieve, as well as a chance to get back the power and pelf they have always assumed were theirs by right. With so many lobbies involved, it is no surprise that bad loans don't always get recognised when they should be. But this should not deter the RBI Governor. He should not relax the norms for NPA recognition and he should not take his foot off the gas pedal in the pursuit of defaulters. The problem with problems is their existence, not the awareness of their existence. Perhaps reversing the growing tide in favour of bigger all-India banks will help. I am sure it will. Smaller banks are local and they lend locally. If businesses fail and banks too fail as a result, the chances are that the consequences are mainly felt within the bounds of the state where they were all domiciled. The states may have to answer instead of being able to deflect the blame onto Delhi which, after all, owns the banks and controls them as well. I am not sure Dr Patel can do much about the ownership of banks during the three years he has been given to begin with. But he could start with preaching to the government on the perils of its ownership and control of big banks. I am unable to understand the twisted logic which holds that business houses are not trustworthy enough to own banks, but the government is. Between government ownership and uncontrolled private ownership of banks, there are a million shades of the ownership control paradigm which have not even been explored. One of the biggest causes of inflation is what used to be known as 'non-Plan expenditure' during the overtly socialist era. In other words it is the outlay that does not create any assets -- at any rate in the public space. Now that the planning process has been relegated to the dustbin of history, planned, non-planned are all the same and come out of the same kitty. This is worse than the Planning process. Behaviourally, 'mental boxes' like planned and unplanned expenditures actually helps us control our budgets and curb our tendency to be profligate. The non-investment expenditure is also the means through which states overspend on so-called public welfare and thus run deep deficits. 'His diplomacy skills will be sorely tested,' feels S Muralidharan. Dr Patel is reputedly a deficit hawk. I do hope he will not become the politicians' owl in controlling deficits. Whatever plans Dr Patel has for the various issues, all of it involves working with the government. That is the problem with the economy: It involves working with the very people who are doing their damnedest to wreck it. Surely an Oxford economist is aware of this unlike his quant-crazed American counterparts. His diplomacy skills will be sorely tested and his name needlessly dragged in the mud. Dr Patel has had the ringside seat on all this in recent times and must have developed some very astute diplomatic counterpoints to tackle them. Dr Patel's predecessor famously said that he is neither a Hawk nor a Dove, but an Owl. The analogy with an owl is not entirely misplaced. Nor entirely off-the-cuff, I suspect. An owl waits and watches and mainly uses one sense (sound) to zero in on its objective. It is patient and operates when others sleep. When it strikes it glides on the most silent wings. When others are watching it by the light of day it is an object of ridicule and appears to be an ullu. Best of luck, Dr Patel. Be a fox to Dr Rajan's lion and an Owl at all times, but dont become a politician's ullu. And whatever you do, don't meet Shobhaa De socially. What led BJP towards this harakiri?